Less than an hour and a half drive from Melbourne, Peppers Moonah Links Resort is comprised of luxuriously appointed rooms and suites. All with inspiring views of the courses, each accommodation room is furnished with contemporary and inviting decor. 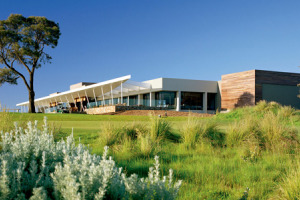 In addition to the 2 highly ranked courses that Moonah Links boasts, other on site facilities include Pebbles Restuarat, a spike bar, swimming pool and volleyball area. The surrounding region also offers a plethora of sights to see and things to do, including bathing in the Peninsula Hot Springs, horse-riding along Gunnamatta Beach, swimming with the dolphins in Port Phillip Bay, and wine tasting at The Cups Estate Winery Cellar Door. Enquire about incorporating their 'stay & play' deal into your package. Includes overnight accommodation, breakfast, drinks on arrival and 18 holes of golf with the use of motorised cart.